You may choose one of two displaying formats: 24 or 12 hours. Hours, minutes and seconds / date, month and year display. You can also regulate the brightness of the tubes (6 levels), and blue back-light brightness (5 modes + switch-off mode). We use only brand-new In-14 Nixie tubes in our vintage clocks, and also we programmed our clocks with the tubes-safety mode, which prevents the Nixies' cathodes poisoning. That's why you may be sure that the tubes will serve you 10+ years. I am pleased to announce that now you can buy our retro Nixie tube clocks at our online shop. We sell our clocks via Etsy, and Amazon shops only, which means that it is safe to buy with us. Your purchase will be tracked within Etsy.com shop. 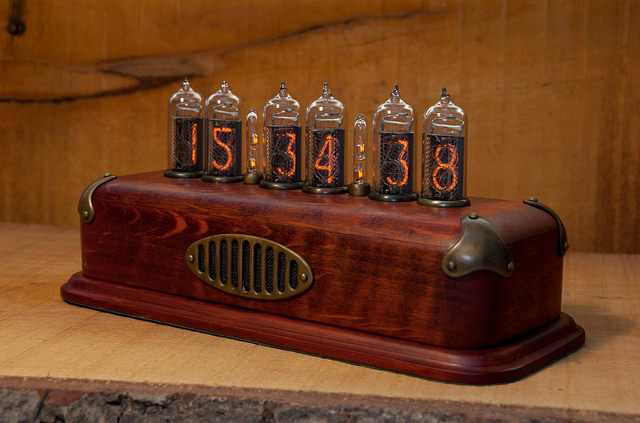 Get this Vault Nixie tube clock for $315 per item for the simple model, and for $360 for the vacuum tube clock with the brass corners. 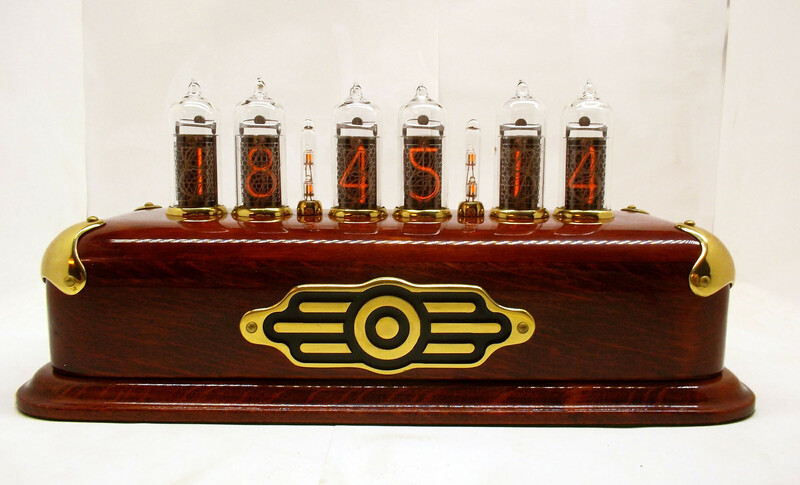 Also, you may buy Steampunk Nixie Tube Clock for $360. You can choose the color you like: walnut color, dark color or red wood. All the enclosures are made of alder, and can be polished with the Finnish oil (green product) by your request. It takes us over 30 hours to make one item, for more details, please read about us. The clocks are fully hand-crafted. We’ve made this retro Nixie tube clocks inspired by Vault-boy and Fall Out world. 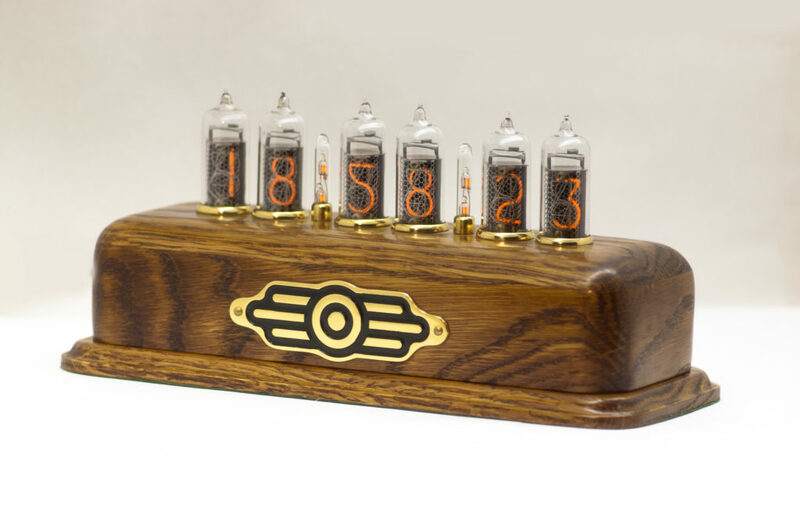 The clocks have 6 modes of Nixie tubes’ brightness. 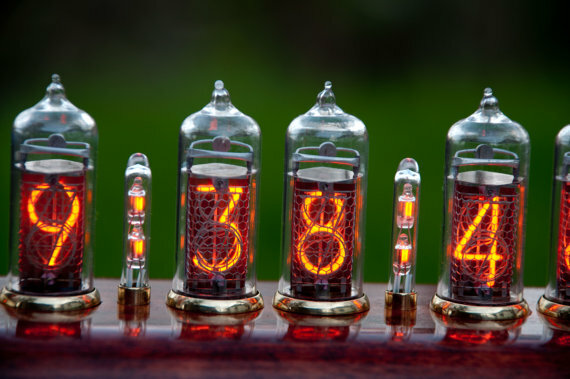 The longevity of the Nixie tubes is up to 200 000 hrs. o prolong your tubes’ longevity, we suggest you to avoid using the brightest mode all the time. We’ve also programmed your clocks with the tube safety mode, that runs every 15 minutes, and prevent Nixie tube cathodes’ poisoning. Aren’t they beautiful? 🙂 Love each and every nixie clock we make. Check our gallery to see more photos. adapter included. 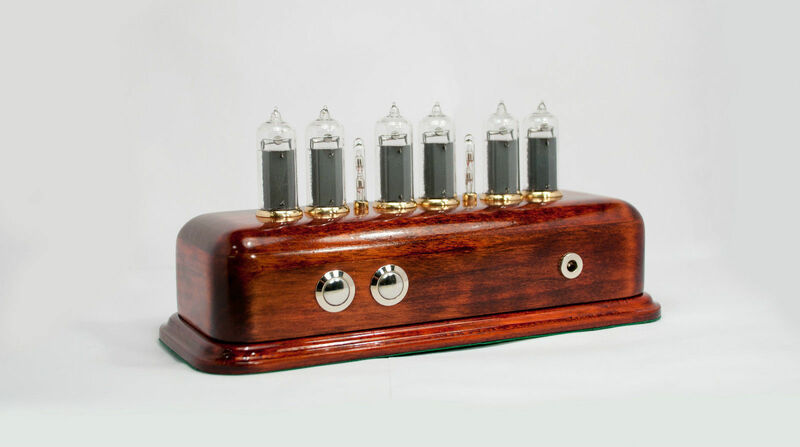 Feel free to ask any questions about Vault Nixie tube clocks, we are happy to chatter about it for hours! 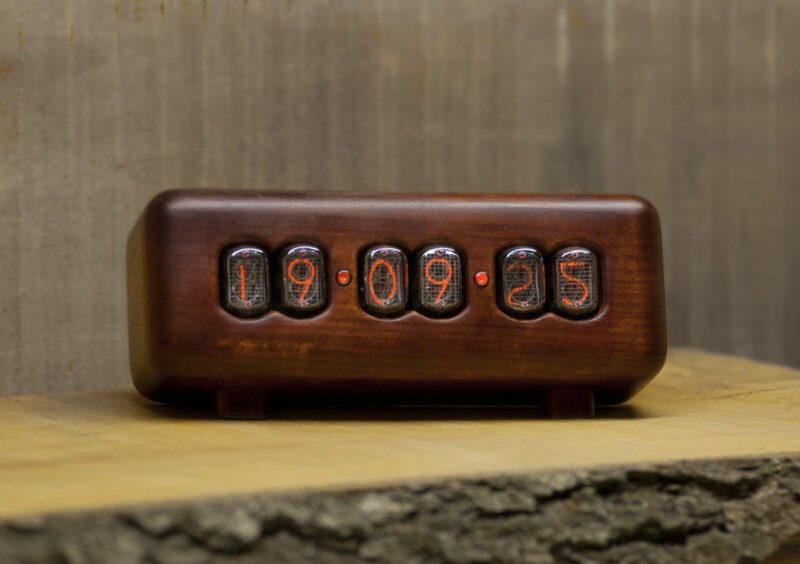 Meet our newcomers: “Woody” – wooden nixie clock with brass corners. You can get this item at $360 per item. And “Qwerty” – simple, plane design that fits Scandinavian style interiors. This item costs only $180 per item, and it’s available in 2 colors: light one / dark one (this color takes +1 week to craft it). We ship clocks worldwide. It costs 30 USD, except Australia (we ship to Australia only with EMS post service, and it costs 70 USD). 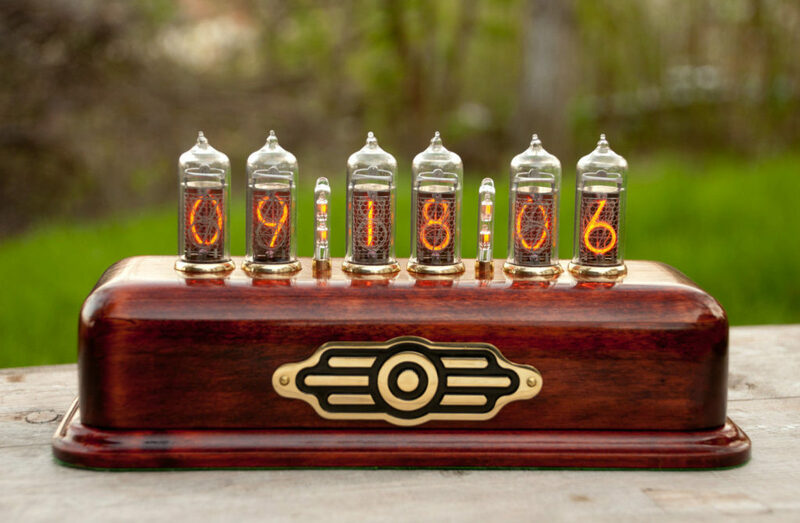 Cheap nixie tube clock 20194.9 (97.39%) 23 votes I usually get letters with the request to make cheap nixie tube clocks. So I worked on new design for the clock, that takes much less time and materials. 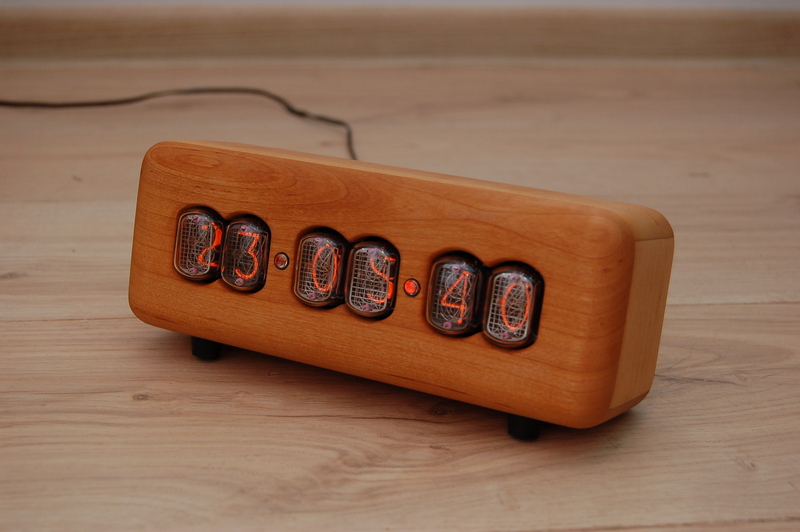 It helped me to set a lower price for my wooden nixie clocks…. How does nixie tube works? Read what people say about our clocks.